Flags have long been used on the land and out at sea and at first glance it would seem that they have only limited utility when they are airborne, but they have been used since man first took to the air in balloons! Achievements in flight space in the last century certainly rank among humanity's greatest technological and scientific achievements. In the early days of aviation, flags were actually attached to aircraft. For practical reasons this practice was discontinued but flags continued to be carried as both personal and commemorative mementos by pilots. Representing this practice is a pair of flags flown around the world in 1938 by the American businessman pilot, aerospace engineer, film maker and philanthropist Howard Hughes, arguably one of the most influential individuals in aviation history. The flags were part of a promotion for the 1939 New York World’s Fair. The practice of taking flags has continued into the era of space travel. 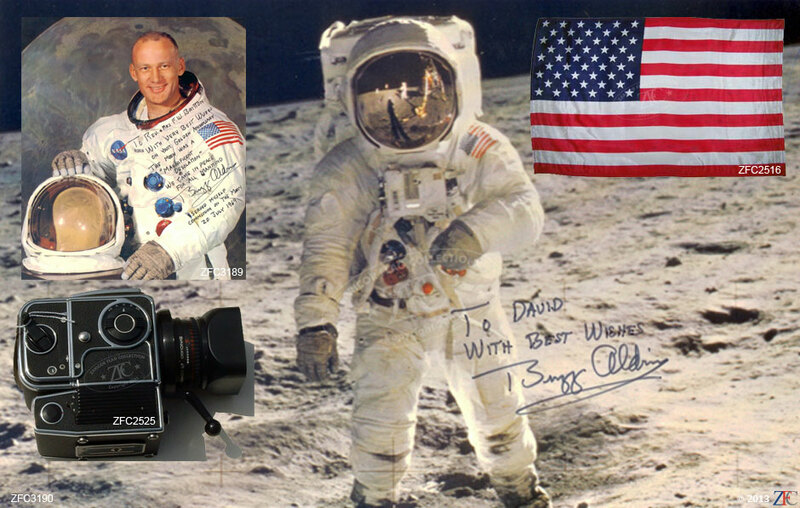 Fully-documented space flags and artifacts are extremely rare, relative to virtually any other established category of historically significant "earthly" collectibles and among space collectibles, "flown" flags from any mission are highly desirable. This Grouping contains one of the rarest of space collectibles, a U.S. flag flown to and displayed on the lunar surface and then returned to earth – made even more significant because it was done by “America’s First Man in Space” astronaut Alan Shepard. This Grouping also contains flags, photographs and artifacts from each of the U.S. space programs: Mercury; Gemini; Apollo; Skylab and the Space Shuttle, as well the Soviet Space program. The most impressive non-flag artifact is one of Neil Armstrong's Apollo 11 Mission Hasselblad Cameras that was previously acquired by the photographic historian Jack Naylor. The Grouping also contains a space mystery the Space Disintegration Flag – a flag from the personal collection of Apollo 14 astronaut Edgar Mitchell that began to disintegrate while in storage.